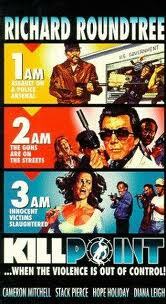 When a cache of guns is stolen from a local armory, and street thugs are running wild shooting everyone in sight, there's only one man tough enough to stop the madness: Lt. James "Jim" Long (Fong)! But he's been feeling depressed lately as his wife had been raped and killed earlier that year. So he teams up with ATF agent Bryant (Roundtree) and the entire Riverside, CA police department to track down the baddies responsible. Luckily for Long's revenge scheme, the same evildoers are behind the attack on his wife as well as the stolen guns: crimelord and all-around kingpin bad guy Joe Marks (Mitchell) and his murderous assistant Nighthawk (Pierce). Will Long and Bryant bring the culprits to justice, and, more importantly, will local TV station KHUD report the story accurately? The stars of Revenge of the Bushido Blade (1980) reunite for this amateurish, haphazard effort that, while certainly imperfect, has its entertaining qualities and would have been ideal for undiscerning drive-in audiences of the day. For example, the editing is choppy: one minute we're seeing Cam Mitchell having a grand old time as Marks, the next we get a several-minute training sequence with Fong in a gym with absolutely no setup or dialogue, then we're back at the police station with Roundtree, etc. Add to that the use of mumbling non-actors in a semi-documentary style (members of the Riverside police department are named extensively in the credits), and the hilariously wooden anti-acting (read: clearly reading from a written source) of Michael Farrell (not the guy from MASH) as Long's Captain, Skidmore, and you get a few yuks, but nothing substantial. Fong as Long is as perfectly wooden as he usually is, and his hair is charmingly Ramones-ish this time around. But the star of the show once again is the immortal Cam Mitchell. He looks like he's having a ball as the nefarious Marks, and hams it to the max, but in the best way imaginable. Marks/Mitchell is the type of villain whose main activities include wearing sunglasses and an ascot to bed, and teaching his dog (Sparky) to smoke, as well as boring stuff like killing prostitutes and enabling the L.A. area to go into martial law. God bless Cameron Mitchell. We'll never see another like him. Stack Pierce, besides having an awesome name, is suitably menacing as Marks' consigliere, and looks like what would happen if Bill Cosby turned evil. The great Richard Roundtree is under-utilized and should have done much more. After teaming up with Leo Fong, he'll probably go back to teaming up with Harrison Muller, Jr. Either that or Ernest Borgnine. So yes, it does have some of the trappings of low-budget filmmaking such as poor audio and a weird pace, but it was director Frank Harris' first directorial film. Unfortunately, his mediocrity seems ingrained, as his next two features, Low Blow (1986) and The Patriot (1986) seem to prove. In the action department, it's pretty much shootings and training sequences and not much else, although Fong does give one unlucky suspect an interrogation he'll never forget. Starring Sparky the dog as himself (as his credit goes) in a movie-stealing performance, though he can't quite top Mitchell, they work well together. 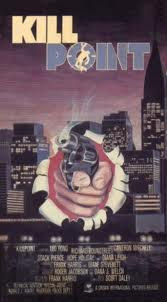 Killpoint was released by Crown International, and then put out on VHS in the U.S. by Vestron. Featuring the catchy closing song "Livin' on the Inside" by Ramona Gibbons, Killpoint isn't really a great movie, but its personalities like the repeat-offender crew of Fong, Pierce and Mitchell make it reasonably worthwhile. I always like to check out Vestron releases I haven't seen yet, so I may give this one a shot. That Cameron Mitchell factor is especially intriguing-- a good baddie can sometimes be better than a good hero. Ty, great review here! Killpoint, along with Low Blow and a few other Leo Fong movies, is on my roadmap too and I'm really looking forward to Cameron Mitchell bringing his unique style of aloof (possibly drunken) acting to the table. Got this as part of the 10-pack Maximum Action sets and this was the film pimped on the cover so I have somewhat high hopes for it as a trash classic. DTVC: I hope you get a chance to see it. Cameron Mitchell does a decent job as the baddie. He always classes up the joint, even when he overacts. Karl: Thanks Karl! Any movie with Leo Fong is worth seeing for his wooden but hilarious acting and fighting. The Low Blow review is coming soon and that is cool you got the 10-pack Action set. I think Scorpion with Tonny Tulleners is on that set. Ooooooh, I was very curious about that one because I got unusually stoked by Tullener's mustache in the Scorpion thumbnail on the back cover. Any thoughts on it? I will DEFINITELY be covering that in the next few weeks. Scorpion is a silly, sometimes slow action movie. Our review of it is on the site! Tonny's 'stache is pretty killer! That is very cool that you have the uncut version of Killpoint! That's interesting that Tullener beat Norris. Always wondered what his move was to beat him?